Kitchenette is the newest envoy, the latest messenger to the open field from Ismaya Group. The most recent one accompanied with Mr. Curry. For several times I had been passing this new establishment and they seemed to gain reputation very swiftly and was indeed not short of customers. 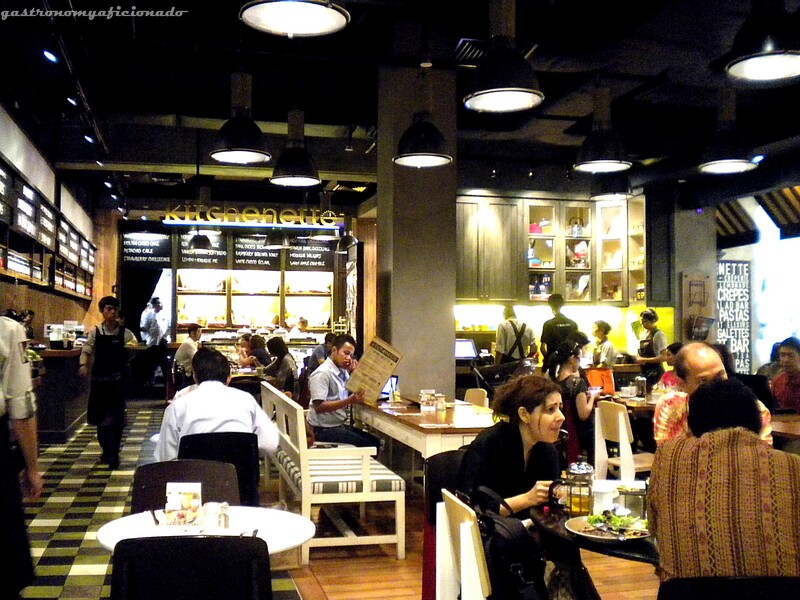 Not to mention also the fact that it’s located in Plaza Indonesia, a prominent mall in Central Jakarta. So if you don’t like crowds or waiting up in queue for too long for your seats, assume brunch time or early dinner time as the best time for taking a breath. Though fate decided that I should come for early dinner but for Friday night! Famished, me and my colleagues had to queue though it’s still 5.30 PM. Meanwhile, I took a tour around the place and observe it a bit. Deriving from kitchen, Kitchenette means a small kitchen. You can see the small kitchen in the middle of the place, very transparent and seem small indeed but definitely a very decent place to work and serve dishes efficiently. 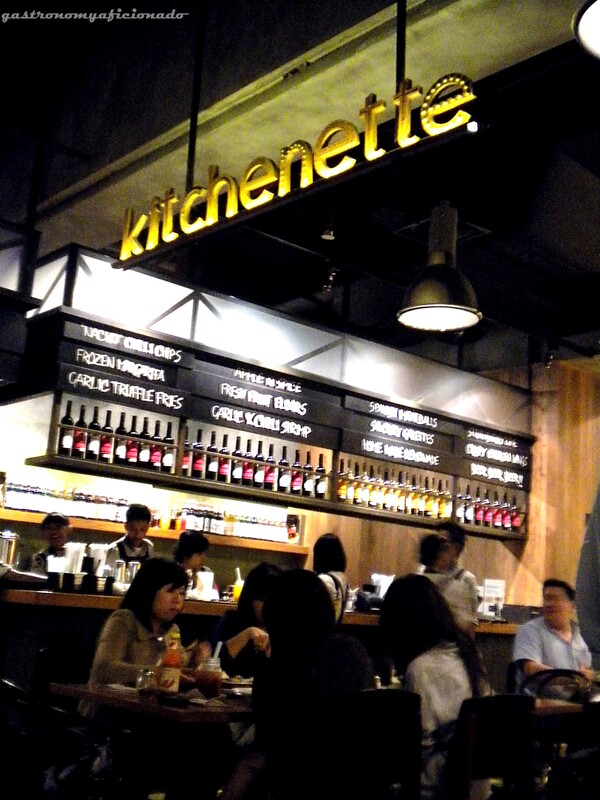 Kitchenette is an open place with no walls to the outer world. Feels like European style cafe just across the street of Paris or Vienna, but you wouldn’t build something fancy like this in Jakarta because it’s too humid and hot. 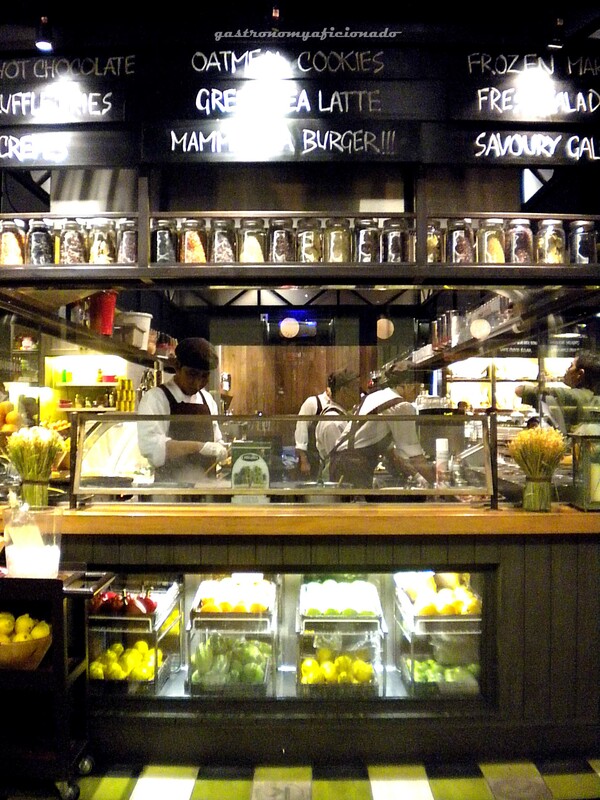 Except in Bandung or Bali perhaps where the air is still fresh and open door cafe like this can be very comfortable. As for the design, Kitchenette is modern and has a warm atmosphere of uptown people, not always too classy but you can find socialites here. With a relaxing, not too dominating jazz or lounge ambient which keeps you from external disturbance but in a level where you can still hear you partner’s voice. The waiting time was not that long anyway though I saw earlier that they serve plastic cups alongside a pile of lemons which I warrant that they made lemonades out of those but they didn’t offer us at all. I thought that perhaps they do that when the queue line is out of hand or when people coming for lunch or dinner rush, then they’ll definitely use lemonades to soothe them for a while. So, we were seated at last. You might think that Kitchenette is a bit too small for such hustle and bustle but when I was seated, it’s actually a bit spacious. Afterwards, the waiter immediately handed us the menus and after we browsed it for awhile, he’s back again ready for everything and very patient indeed. We hadn’t yet concluded what we wanted for that night and keep asking the guy for the details of the dishes but he proved himself worthy and knowledgeable about it. He also gave us suggestions as a waiter should do of course. But he’s not without his flaws though. I had been interested more in galette and there’s actually discounted appetizers such as soup or salad to accompany it. 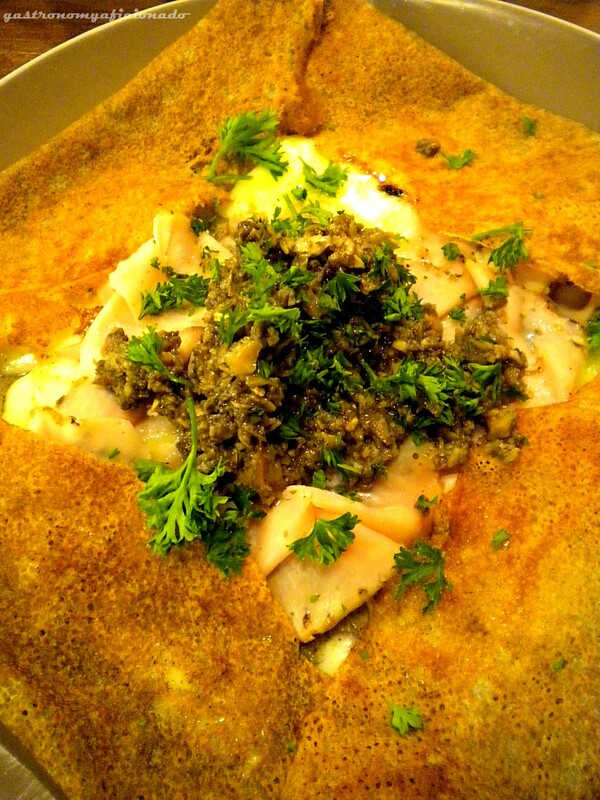 I had asked him whether this kind of combination can also be done for other dishes besides galette. He said none beside galette, but from what I saw later actually, it can be combined and it’s on the menu for God sake. Well, at any rate, galette for tonight would be good since it has been Kitchenette’s signature menu and specialty alongside the crêpe. Each of Ismaya Group restaurants has its own character. For instance, Mr. Curry definitely specializes in curry, Puro in Italian, Pasta de Waraku in fusion pasta, Social House for tapas and wine, and Kitchenette here for the crêperies. Two types available here, galette for the savory and crêpes for the sweet. Both of them were originated from France. That’s pretty obvious right? Galette is a thin, crispy pancake made out of wheat, usually garnished with savory ingredients such as cheese, meat, egg, etc. Whilst crêpe as we have known commonly, usually filled with sweet things like ice cream, melted chocolate, sometimes added with cheese, and can also be filled with savory ingredients. But here, in Kitchenette, both of them are differentiated. The galettes are uniquely titled with French guy names and the crêpes with American country ladies names. Mine’s Antoine Ego galette (IDR 65,000) that consists of ham (pork or turkey), mozzarella cheese, and mushroom caviar with truffle oil. I took the appetizer package and picked Tabouleh Couscous (IDR 25,000 – only if combined). I’ve always wanted to taste couscous, a traditional Middle Eastern/North Africa dish made out of wheat and with certain method of cooking, you’ll see it more like grated parmesan cheese. 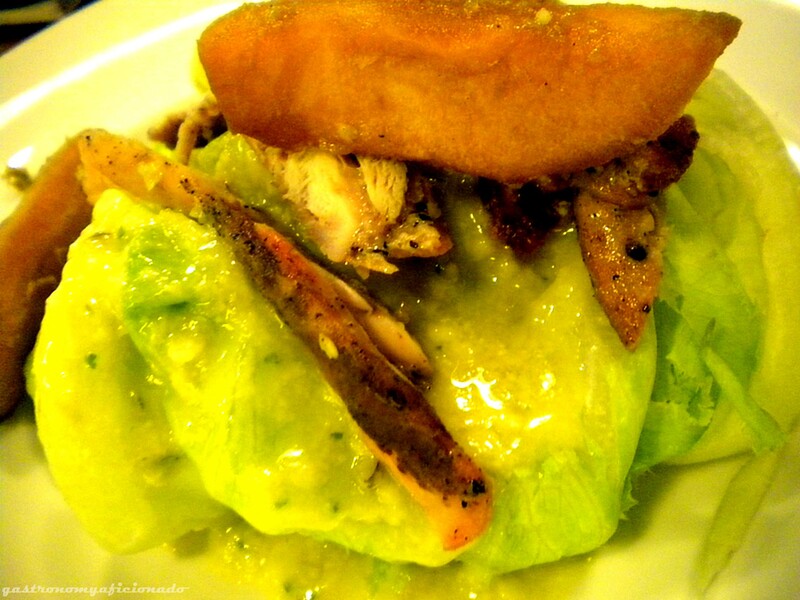 For the combination menu, the meaty salads are excluded but the rest are available. The rest of my friends picked Arnaud galette (IDR 69,000) and this one consists of two mini beef hamburg, fried egg, Dijon mustard, Swiss cheese, and caramelized grilled onions. Then there’s also Pan fried John Dory fish fillet over sauteed garlic spinaches with Mediterranean sauce (IDR 59,000), The Maid’s nasi goreng with spicy seafood, fried egg, and chicken satay (IDR 49,000), and a more conservative friend of mine a.k.a on-a-diet friend picked a salad Iceberg wedge with roasted pears, walnuts, and Gorgonzola dressing (IDR 37,000, added with regular chicken IDR 10K and large chicken IDR 20K). My pick was indeed the best. The salad may be a bit strange but it actually isn’t. In Indonesian dishes notably fried rice or martabak, usually accompanied by pickles and the sourness was quite similar. 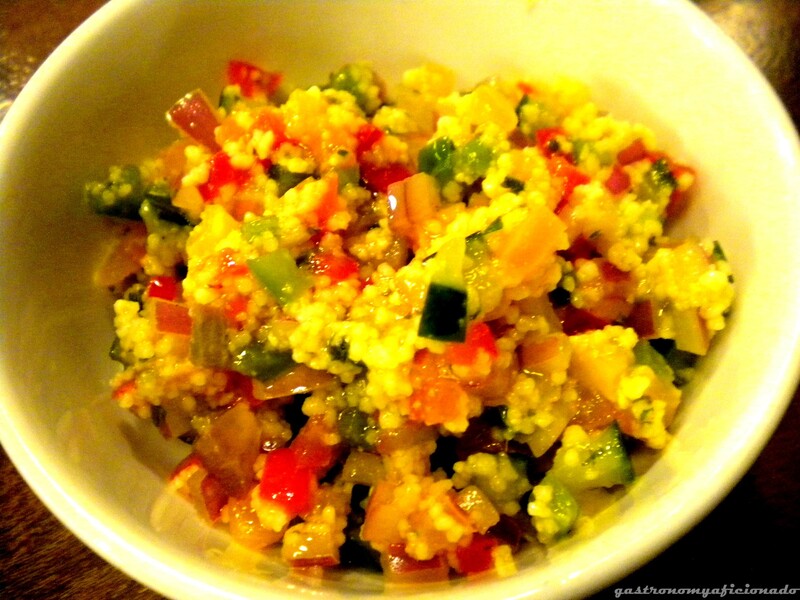 The salad consists of diced shallots, cucumbers, capsicums, carrots, and covered with couscous. I added the olive oil as usual. I was fond of it but if you wanted a safer salad, pick the one you usually like or just the soup. My Antoine Ego galette was nice. The cheese, turkey ham, and the mushroom caviar fit perfectly together bringing on the tenderness and they melt wonderfully inside my mouth. You might want to add pepper, olive oil, or even chili sauce for more spirit but I prefer the original taste. A bit of pepper and olive oil might do but not the chili sauce. My friend’s Arnaud galette was okay too. More meaty and full of proteins, but it’s not actually that special. In terms of balance, mine’s better though you may see it not too inviting but still, it’s the best pick of the night. It was a pleasant night but not for my friends, they seemed to think that Kitchenette was overrated since the food was not that special and the fact that they’re still hungry! Haha.. As for me, it was a very fulfilling dishes, too expensive, and judging that you can get crêpes for a bargain price in food stalls on malls plus the fact that galette is originally a traditional, peasant dish way back in France and it’s too expensive. 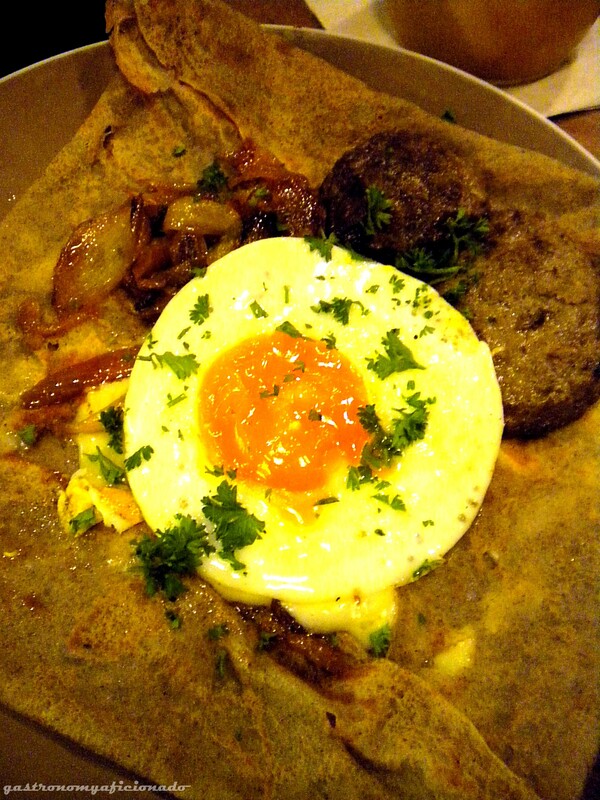 To be honest, I have to agree my friends too that the food was not that extraordinary though my galette was good. So Kitchenette, no matter how magical your place is so you can attract so much customers but heed my warnings, improve thyself and prove that thou are worthy enough for my next visit. 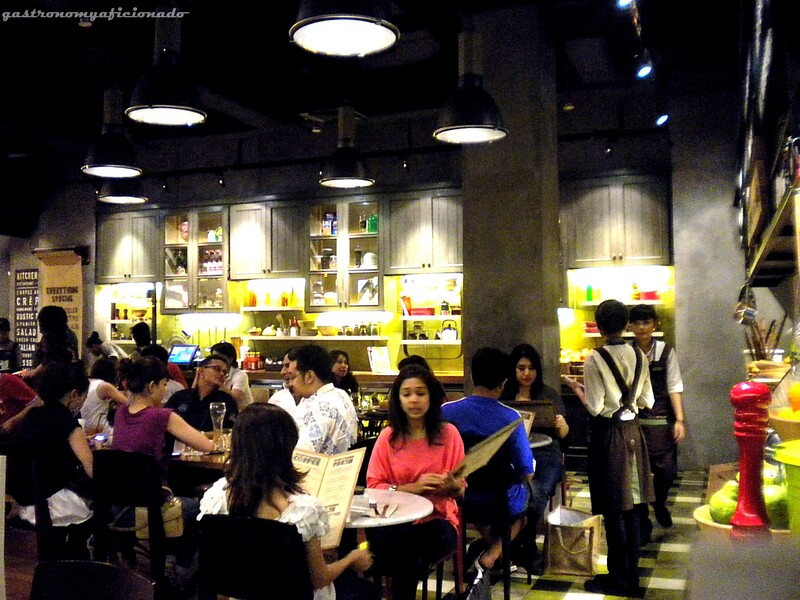 Wassalam..
Price ranging from IDR 25,000 to IDR 125,000 for either appetizers and main dishes. Main dishes are pretty expensive. For five people the total was IDR 525,525. Good number but it’s very pricey indeed. Feels good for me though crowded all the time but I like Canteen better or a bit better than Social House here. Very knowledgeable but not without flaws. Happily assisted us in taking our photos and even offered his service for additional shot! Pick your dish carefully, expect a bit ordinary taste, and definitely, half-full tummy in the end. Kitchenette ini produk grup Ismaya yg memang lebih mengetengahkan hip-nya ketimbang rasa. Jadinya emg mahal2 apalagi krn di mall pula.